This morning we got up early (for us!) 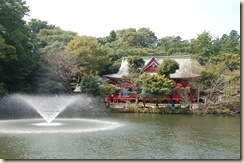 and went for a stroll in nearby Inokashira Park. It was an absolutely beautiful morning. The trees in the park are just beginning to be kissed with Autumn gold, but the weather is still pleasantly warm. There is something about the light here that is extraordinarily beautiful – the trees in the distance are rendered a kind of smoky blue that is extremely evocative of classic Japanese art and paintings. Even though there are loads of people in the park on a day like today, somehow the crowds seem to do little to spoil the tranquillity and elegant beauty of the place. It is quite the most wonderful haven of timeless peace in a sea of frantic urbanisation.